Discover the perfect combination of Caribbean charm and European sophistication when you book a stay at Renaissance Curacao Resort & Casino. 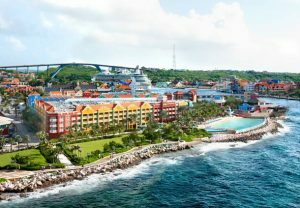 Our luxurious Curacao hotel offers easy access to a variety of popular attractions, including Christoffel National Park, the Sea Aquarium, Dolphin Academy, Curacao Museum and upscale shopping, dining and nightlife. After an exciting day of exploring the island, relax in elegant guest rooms offering plush bedding, LCD TVs, spacious balconies and spectacular ocean views. Or lounge on our private beach, which boasts sugary white sands and crystal-clear Caribbean waters. Enjoy a memorable meal at one of our five celebrated restaurants, which offer everything from prime cuts of steak to tropical cocktails. Our Curacao resort is also home to an enticing casino, state-of-the-art fitness center, infinity pool and 8,600 square feet of event space. Experience an unforgettable stay in the Dutch Caribbean. Book a stay at Renaissance Curacao Resort & Casino today!